You are the owner and head chef of the week-old and 1940s-themed Mack and Geez, your first five-star restaurant. An anonymous tip has told you that highly-influential food critic, Vera Davenport, will review your restaurant today, and you've heard she doesn't like theme restaurants. Plus, you have both a staff shortage and a huge entrée shortage. Things couldn't be worse. But if you can manage to get a good review after tonight, Mack and Geez might stay in business. You are wearing your chef's hat and carrying nothing. The expansive kitchen contains an oven, rangetop, counter, pnuematic tube station, utensils, fishtanks, cupboards, glass cabinet, dishwasher, refrigerator, and sink. Your office is north, the seating area is east, the back alley is west, and the wine cellar is downstairs. 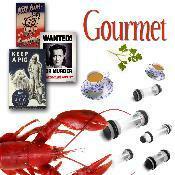 Gourmet (Aaron A. Reed; 29-Sep-2003; Z-code 5). Story by Chad Barb and Aaron Reed. IF Comp 2003: 5th place of 30 entries. Also 3rd place for Miss Congeniality. XYZZY Awards 2003: Winner of Best Puzzles. Finalist for Best Setting and Best Individual PC (the chef). Download gourmet.z5 from the IF Archive - The story file. Gourmet (Aaron A. Reed; 2003; Z-code 5). Gourmet (archived) - at Baf's Guide. Gourmet - at IF Ratings.